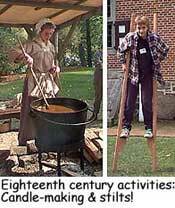 A visit to Historic Hudson Valley's Van Cortlandt Manor is a trip back to the eighteenth century, especially on a day when historical interpreters and volunteers are demonstrating crafts and skills of the era in full costume. We met master brick-maker Steven Bush first. 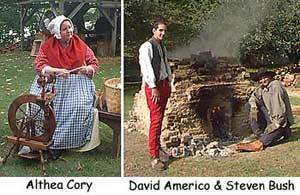 He and volunteer David Amerigo were tending the fire in the kiln where a year's supply of hand made bricks were being baked at 1800 degrees Fahrenheit. "It takes four days," explained Steven. "And the fire has to be stoked every half hour. I've been here for two days straight already." At night, he stays nearby with a twentieth century alarm clock to wake him up every thirty minutes. Fortunately, he can sleep while the bricks cool down, which takes another three to four days. The finished products are used to repair and restore buildings and walls on the property. Nearby we watched Althea Cory spin lamb's wool into yarn and went inside the kitchen where a feast was being prepared over an open hearth. Blacksmiths, candle-makers, soap-makers, wool-dyers, and quilters were all hard at work doing customary autumn tasks in preparation for winter. The only person engaged in more frivolous activity was the stilt man, who was happily providing instruction to all comers. Van Cortlandt Manor was originally owned by Pierre Van Cortlandt, who was New York State's first lieutentant governor. The property was purchased by the Rockefeller family and is now one of six historic sites operated by Historic Hudson Valley, a non-profit educational organization dedicated to preserving the history of the area. Located at a beautiful spot where the Croton and Hudson Rivers meet, Van Cortlandt Manor is an inviting retreat into a bygone era.